I love a good makeover. I don’t mean hair and wardrobe makeovers. Of course those have their virtues, but some of us prefer to look for kitchen faucets to going handbag shopping. As a designer and decorator, I get excited about the prospects of making a home out of something drab, dreadful, in collapse or God forbid, in poor taste. Give me a ruin any day rather than someone’s mediocre attempt at fixing a house. The more extreme the potential for change, the more exciting. My role in the film industry was to transform spaces, in studio or on location. Be it creating an accident scene with car wrecks and fake blood, designing an opulent office with the latest in design or building a miniature Taj Mahal dog house, every set is a transformation. Creating a temporary, imaginary reality is of course different from designing for real life, where a place cannot only look good (or whatever effect the director wants), it also has to be habitable and functional. The film industry teaches you to be fearless and proactive. You fix it, you rig it, you invent it, or you unearth somebody who can do it for you, magically overnight. If you want to survive, regardless how unreasonable or absurd the demand may be, you find a solution. So when it comes to the extreme, I’ve already been there. A makeover is a change in appearance, which in my opinion can be applied equally to buildings as to human bodies. The word extreme implies something that is furthest removed from the centre or from the average. The expression is used in sports, though why not in renovations? Makeover shows have been popular for decades and the spinoff home makeover editions have actually exceeded the popularity of the original shows (Easily understandable to me, who prefer watching paint dry than someone applying the perfect eye shadow) While the US Extreme Makeover Home Edition recreates a dwelling for a family in an extreme situation, I prefer to apply the Extreme Factor to the renovation itself. Just like an extreme facelift, a building can undergo radical transformations until it is hardly recognizable. 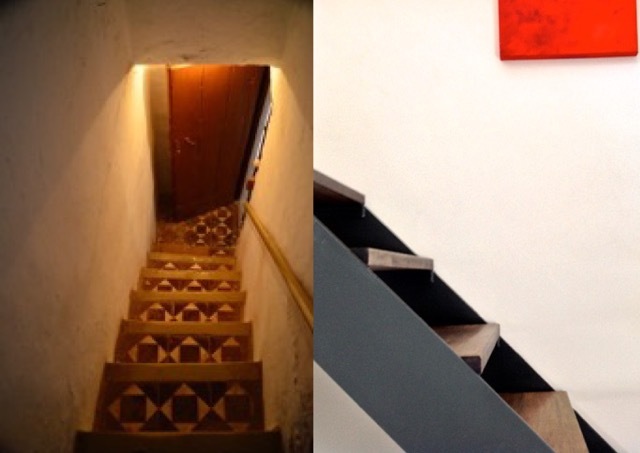 Since we are creating an imaginary show, ‘our’ Extreme therefore refers to the difference between the before and after of a home. 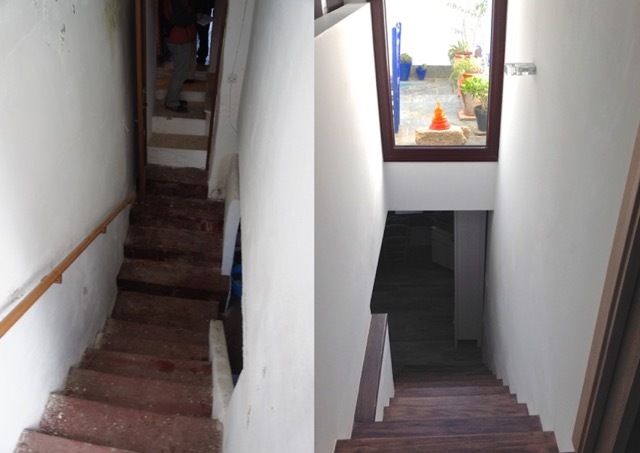 So, why would I say that our project deserve the label of an Extreme Makeover? 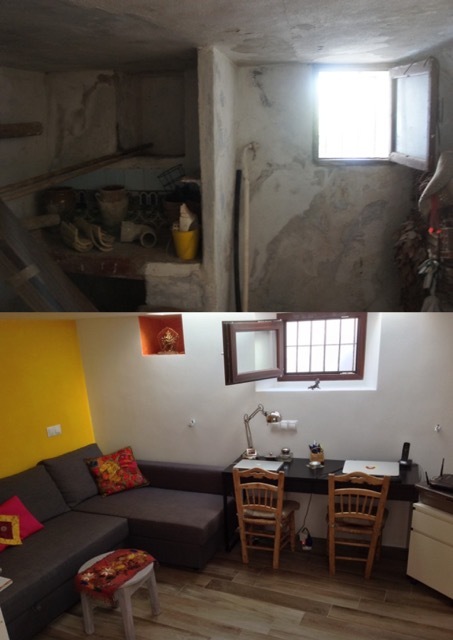 First – because we had the challenge of making a 3-meter-wide (not even 10 feet) house into a liveable space. Next, because there was no foundation, so the exterior walls and interior floor were literally sitting on bare soil, which is great if you want to dig secret tunnels, but not if you want a sturdy and dry home. 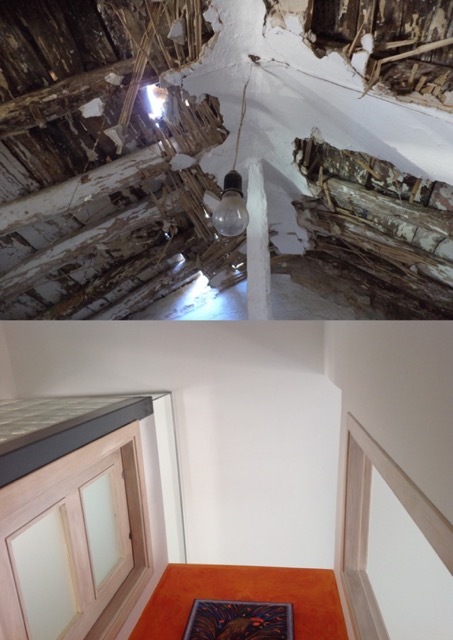 In addition, the 80 cm thick side-walls were crumbling, the roof was falling in, the stairs were treacherous at best, the basement had a ceiling clearance of a humpback, the second floor had a clearance of half a meter or less than 2 feet in one end and not a single door or window closed properly. 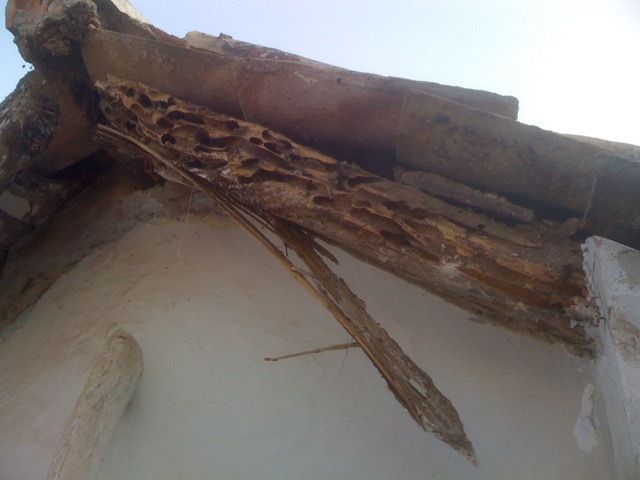 Besides, every one of the ‘supportive’ ceiling beams on both floors were rotten to the core, including the ones we share with the 2-meter-wide neighbouring house. This threatened to collapse both dwellings, once attached, and stranded us many times during the constriction. In addition, the house was barely wide enough to bring in mechanical equipment. And, to top it off, the last resident (other than a tailless lizard and a wild cat with quintuplets) died some 20 years prior, leaving an entire Iberian ham to rot in the basement. Oh joy! 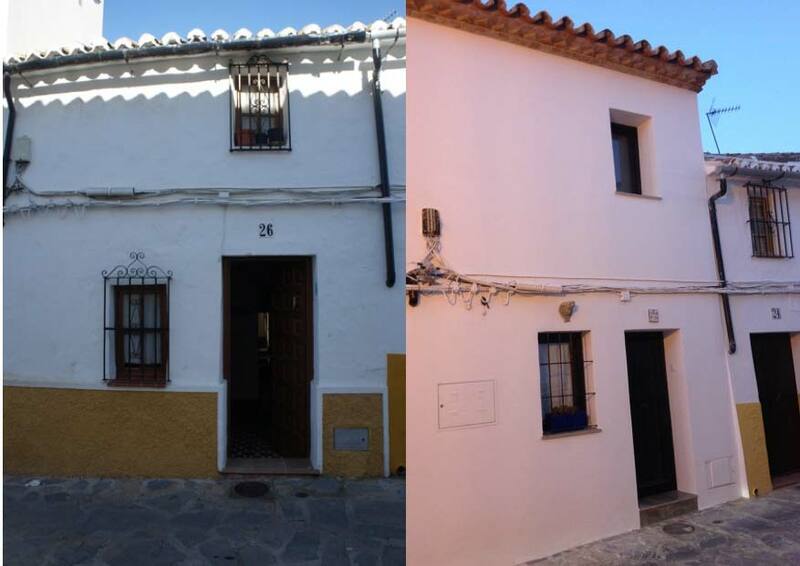 Anyhow, this is our casita’s Before and After story, in pictures and a few words. The façade of the house had to be kept ‘as is’ by law, so we could not expand the dimensions of the windows or the front door, nor make the roof higher than the neighbouring buildings. In the end, we were permitted to make the front door slightly taller, allowing for the fact that people have grown in past generations. Thankfully we were allowed to scrap the rough pebbled skirting of the house, though we could do nothing with the unsightly cables and various old electrical boxes that were attached and running along our façade. A bit of a bummer, but I plan to make some metal cut- out crows to perch along, to bring some humour to the situation. Peaking inside the house, one used to see cheap plywood 1950s furniture covered in doilies and ‘decorative’ nips, synthetic mosquito-net curtains and peeling paper-thin walls dividing the house into dark little rooms. 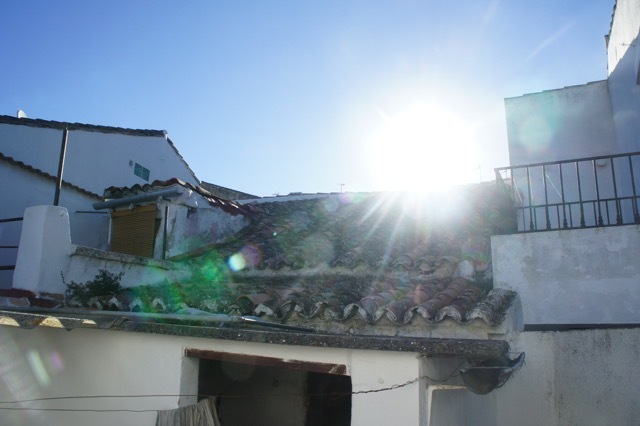 In other words, a typical rural Andalucian workers’ home, except for the fact that there was no kitchen, nor a shower or a tub. (Not that we intended to use them…) Our first objective was to bring in the light, so all interior walls had to go – permanently while we made the entire back of the house of glass. We asked for polished cement floors, but allegedly the machines could not get into all the corners, so they had to hand-polish them. Part of the excitement of Extreme Makeovers is the unpredictability. The main terrace was originally partly covered in carcinogenic concrete roofing and had only access through the basement. We opened it up and added a small laundry room and tool shed on the left. 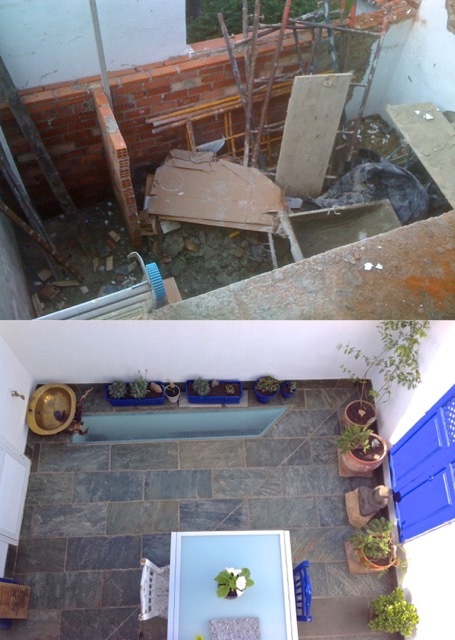 To bring more light to the basement, we added a glass in part of the terrace floor. The basement was originally accessible through a double stairs leading down to the cellar and up again to the terrace, all crumbling and uneven. The basement itself was damp and leaky and one could not stand upright without hitting the mouldy, peeling ceiling. We were granted to dig down further 40 cm, with the careful eye of before-mentioned archaeologist. Otherwise, everything was gutted, only keeping the existing window opening. An older window, closed up by the neighbours, were made into a niche. The ceiling had a lot of unintended ‘skylights’, in fact more each day. We added as much height as we were allowed, leaving the ceiling vaulted and open, other than glassing in bathroom. The bathroom was originally storage for nuts and useless knick- knack. There was unfortunately very little to save, though I did strip and restore the window, using it in the laundry shed, painted Cantabrian Blue. 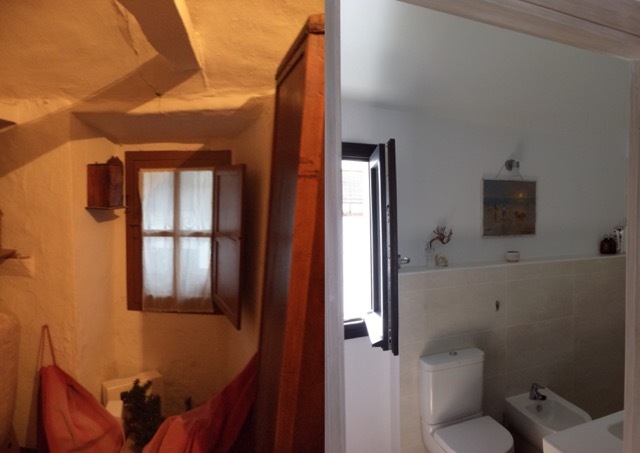 Since we had ripped out the existing toilet, we put our bathroom upstairs, with a walk-in shower with pebble stone floor. For additional light, the wall to the stairway is glass brick and the door has frosted glass. We were not allowed to put in a French balcony, but a local carpenter made the custom beech window. 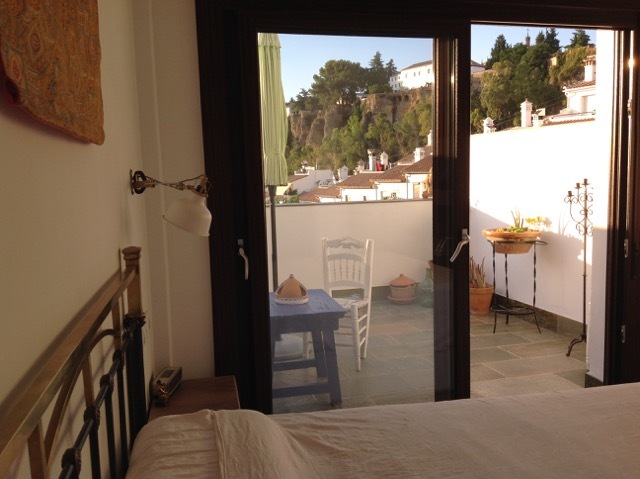 The only item we cannot find here in Spain is a brushed nickel swivelling-angle window-stay for inward- opening windows. Nobody here gets why on earth we wish to control the angle of the window’s opening, nor that this type of contraption could prevent the window from banging shut. 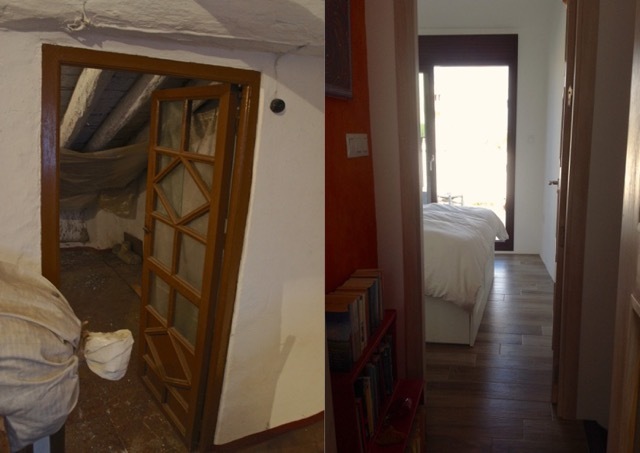 The bedroom was originally a small loft without much practical purpose, due to the steep slanted roof. There were no windows, nor ventilation, though I did find an impressive homemade double-header mousetrap there! As with the main floor, we wanted to bring in maximum air and light, making an open bedroom. The upper terrace with views of Ronda’s Tajo is entirely new, resting on what would have been the roof of the old main floor. 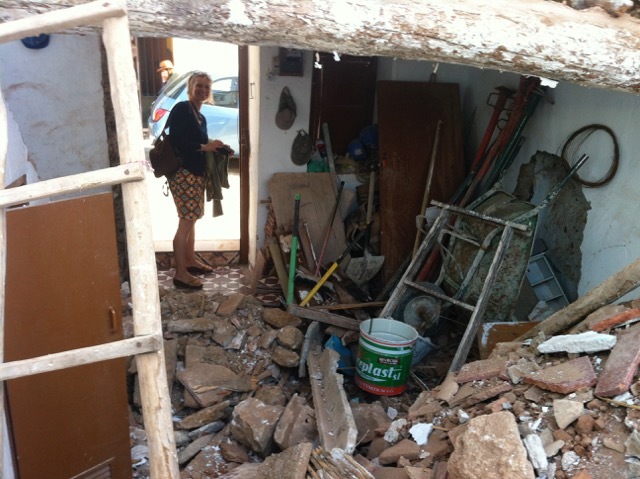 I hope you have enjoyed our first house-tour of the Andalucian Extreme Makeover Home Edition. If you need help with an Extreme Fixer-Upper, let me know. Maybe next time the TV crew will join us?